It’s important to send a thank you letter just after your job interview. 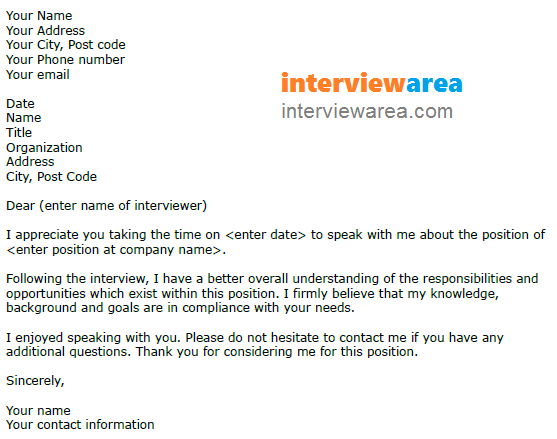 Use this letter example if you had an interview recently and want to say thanks to the interviewer. I appreciate you taking the time on to speak with me about the position of . Following the interview, I have a better overall understanding of the responsibilities and opportunities which exist within this position. I firmly believe that my knowledge, background and goals are in compliance with your needs. I enjoyed speaking with you. Please do not hesitate to contact me if you have any additional questions. Thank you for considering me for this position.